Buspirone is used to treat certain anxiety disorders or to relieve the symptoms of anxiety. 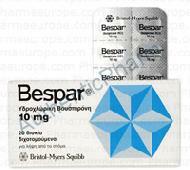 However, BuSpar usually is not used for anxiety or tension caused by the stress of everyday life. It is not known exactly how BuSpar works to relieve the symptoms of anxiety. Buspirone is thought to work by decreasing the amount and actions of a chemical known as serotonin in certain parts of the brain. Take BuSpar only as directed by your doctor. Do not take more of it, do not take it more often, and do not take it for a longer time than your doctor ordered. To do so may increase the chance of unwanted effects. After you begin taking BuSpar, 1 to 2 weeks may pass before you begin to feel the effects of this medicine. All medicines may cause side effects, but many people have no, or minor side effects. Check with your doctor if any of these most common side effects persist or become bothersome: Blurred vision; dizziness; drowsiness; excitability; headache; light headedness; or nausea. Seek medical attention right away if any of these severe effects occur: Severe allergic reactions (rash; hives; itching; difficulty breathing; tightness in the chest; swelling of the mouth, face, lips, or tongue; unusual hoarseness); abnormal muscle movements; chest pain; fainting; fever; irregular heartbeat; loss of coordination; memory problems; new or worsening mental, mood, or personality changes (eg, anger, hostility, confusion, depression); seizures; suicidal thoughts or actions; unusual restlessness; or vision changes.